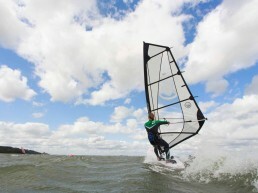 Always wanted to give windsurfing a go, but never knew where to start? We offer windsurfing lessons with fully qualified instructors on the beach at St Helens, a short walk from our headquarters on the Isle of Wight. 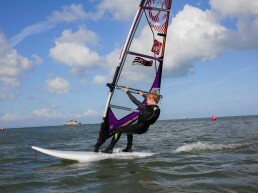 Our kit is perfect for beginner to intermediate level, with more advanced boards coming soon. 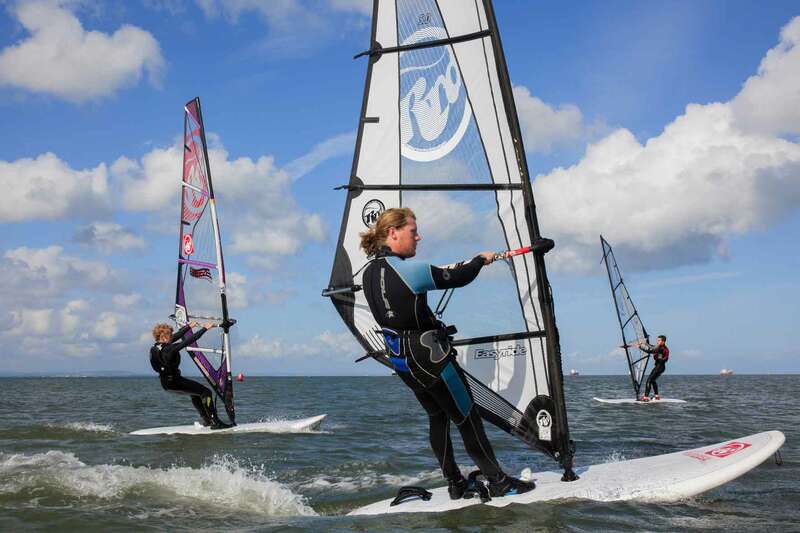 Our Junior Windsurfing club is back! Join us every Friday from 1700 for tuition and practice with our fully qualified instructors. All abilities welcome. Booking essential as space limited to 6. 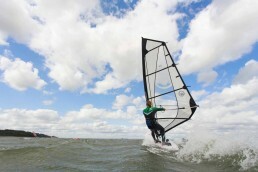 By popular request, we will also be running and Adult’s Windsurfing Club on Wednesday mornings. Join us from 09.30 for 90 minutes on the water, followed by coffee and croissants at our HQ. Cost? £20 per session, or 6 for £100. Our beginner’s week will get you up surfing in no time. 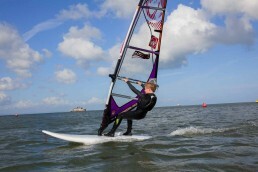 We will teach you the basic techniques of balance, turning around and starting to surf in a safe environment. Our group muck-in sessions are for a maximum of 6 people and are a great way to learn and progress.  Take a look at our Activity Calendar to see available slots. 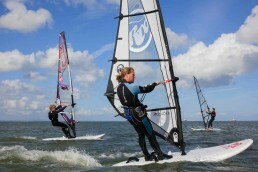 For more intensive tuition, book for a private windsurfing session. Private sessions are suitable for any ability, from total beginner through to advanced. 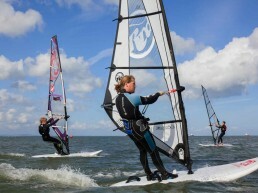 Included in the cost of all the above sessions are wetsuits, splash tops and buoyancy aids. Our alert system is great for catching those high wind days. 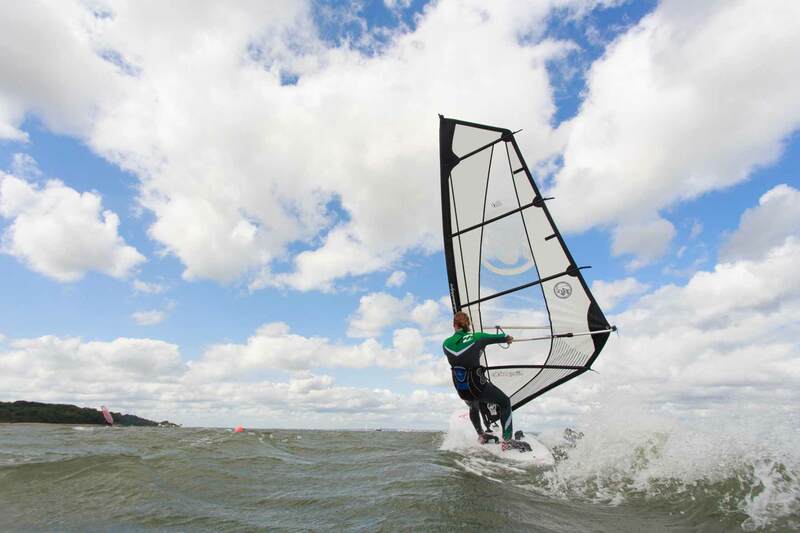 If you register with us then when the wind is up we send you a text and tell you where we are heading. All you have to do is let us know you are coming and turn up. We will have the kit ready for you on the beach.